Kit McMahon is a young girl living in the small village of Lough Glass, where everyone knows each other. She is believed to live a charmed life - has a doting mother and father, a brother she gets on well with, many friends (including the shallow but vivacious Clio Kelly). One night Kit's mother Helen goes out walking and never comes back - after months of searching, a body is found and Kit mourns the mother she has lost. At the same time we start following the story of Lena Gray in London, an up-and-coming businesswoman who loves Louis Gray with an intense and dangerous passion. The lives of Lena and Kit eventually collide with explosive results, leaving Kit considering hard the very nature of love. The main reason for this is that the central premise - which I gobbled up with delight as a youngster, and found extremely credible - is actually pretty far-fetched. I mean, Binchy sets it up pretty well and it does come as a result of some fairly disastrous decisions that seem almost reasonable, but, on this occasion, I found myself wondering how this central premise could possibly have ACTUALLY happened. I think I am looking at the novel from a) more modern eyes and b) the perspective of someone who has no real experience of Catholic religious beliefs. Possibly others would find the premise easier to swallow. On top of this, there are some really horrible characters in this novel. Kit herself is fine - she's energetic and decisive and has a strong moral compass. The cast surrounding her are less sympathetic for the reader - we have a love rat, a doormat, a stuck-up so-called best friend *sighs* Just thinking about them makes me both frustrated and angry! I wanted to shake them and tell them to sort their lives out. There was also an inadvised subplot involving a character called Sister Madeleine, which seemed to sit uneasily alongside the rest of the novel and could have been excised to make this a more streamlined tale. So why did I read it so compulsively? Literally gulping it down? Because of Maeve Binchy's warmth. Her writing is exquisite in terms of carrying a reader along - beautifully simple and direct prose that wraps me like a warm blanket in front of a roaring fire. I think in all seriousness that, with Binchy's hand on the pen, I would quite happily read a shopping list she'd written! There is just something about her novels that make me smile - reading for the pure sake of enjoyment (which is something that occasionally becomes a little tough as a reviewer). I would urge people with the desire to read something gentle, but with incisive observations on human nature, to pick up a Maeve Binchy novel. The Glass Lake is not her best, but is still a fine example. 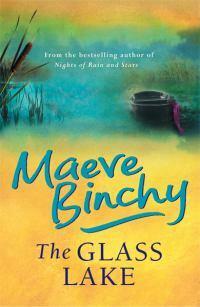 My mother-in-law loves Maeve Bincht- I think I shall have to borrow some of hers after reading your review!